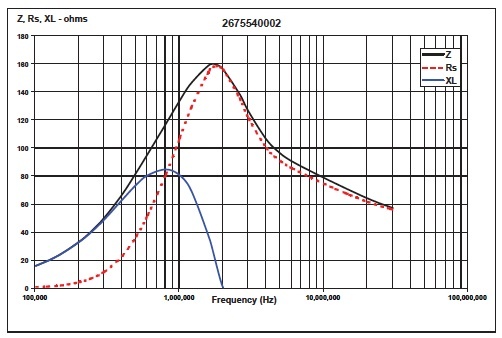 Utilization of bobbin ( spool or drum) cores is a simple and cost effective way of designing a power inductor. This calculator makes use of standard bobbins in Fair-Rite's # 77 material - so frequency is limited to about 10 MHz, depending on the winding. 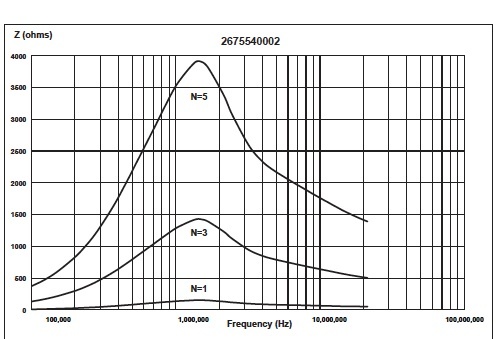 Maximum possible NI is 750 Ampere-Turns, maximum current is 15 Amps ( using AWG# 10) and minimum wire gauge is AWG# 30. 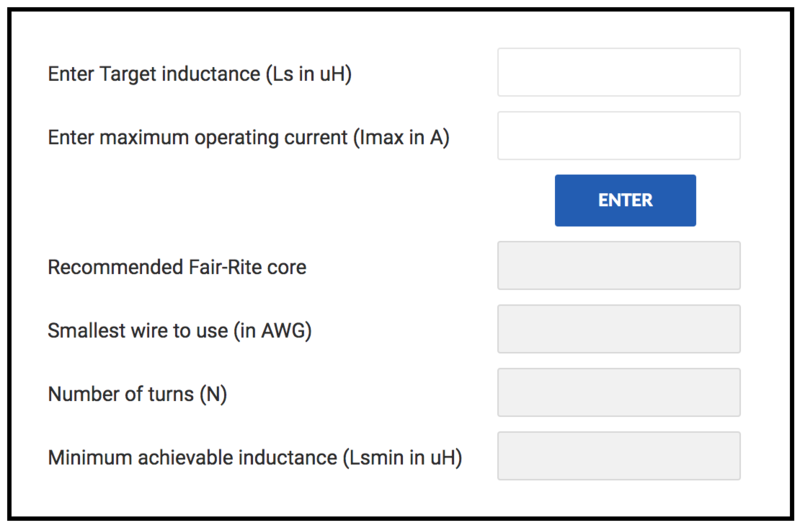 The user enters target inductance and maximum operating current : the first thing the calculator does is selects a minimum wire gauge based on 700 cir-mils/Amp ( 2.8 sq.mm/A) Current Density. Then the calculator estimates number of turns required and selects the smallest size bobbin core capable. Uncoated bobbins, magnet wire and 90% copper fill ratio are assumed. 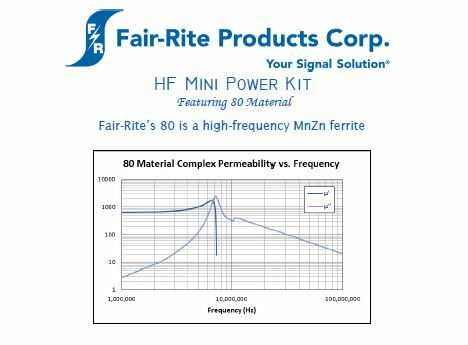 Featuring our NEWEST material “80”” is the focus in this High Frequency Power Material kit containing various sizes of toroids, EQ and I cores to DELIVER your DESIGN. Fair-Rite’s new 80-material! 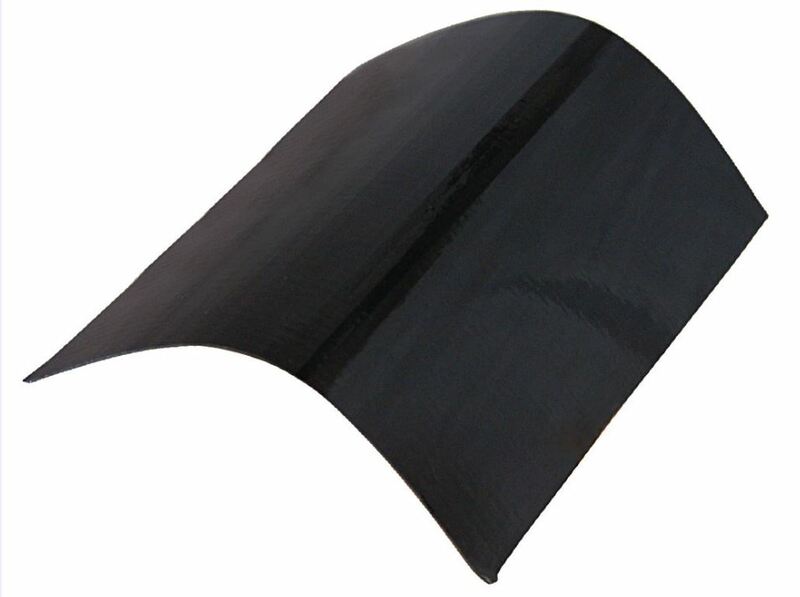 Our latest addition, this Manganese-Zinc ferrite has been tuned to operate in SiC and GaN switching power supplies with a stable temperature response for designs up to 5 MHz. Our newest High Frequency Power Material kit contains various sizes of toroids, EQ and I cores for designers to test how 79 Material will perform in their design. 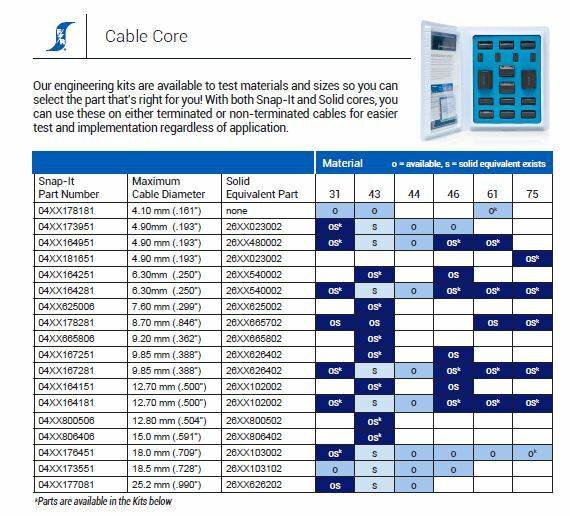 Fair-Rite’s 79-material product line continues to expand and include new geometries for power supply designs. 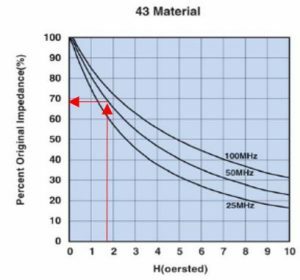 With operating frequencies up to 1 MHz, this material is optimized for minimal losses at elevated temperatures. This document provides the appropriate information to allow a user to determine the effects on impedance of a Round Cable EMI Suppression core in the presence of differential mode currents. The high-Q achievable by self-resonant structures increases the range and efficiency of wireless power transfer (WPT). However, to date implementations of this structure have been thick, which limits their practical implementations. In the attached paper, they explore the design of thin self-resonant structures. Looking into a computationally efficient 2-D optimization algorithm is proposed to design thin resonant structures and illustrate the trade-offs in the design, and a new magnetic core shape is proposed which shapes the magnetic field lines to be parallel to the conductive layers and reduces current crowding. If you have a Fair-Rite Snap-It in hand, but are not sure of the material or part number, you may still be able to identify it! Since all ferrite materials are the same color and multiple materials use the same case (which only shows the part number if it was in a kit), determining the part number can be difficult. This article explains the process to determine the part number of a Fair-Rite Snap-It. 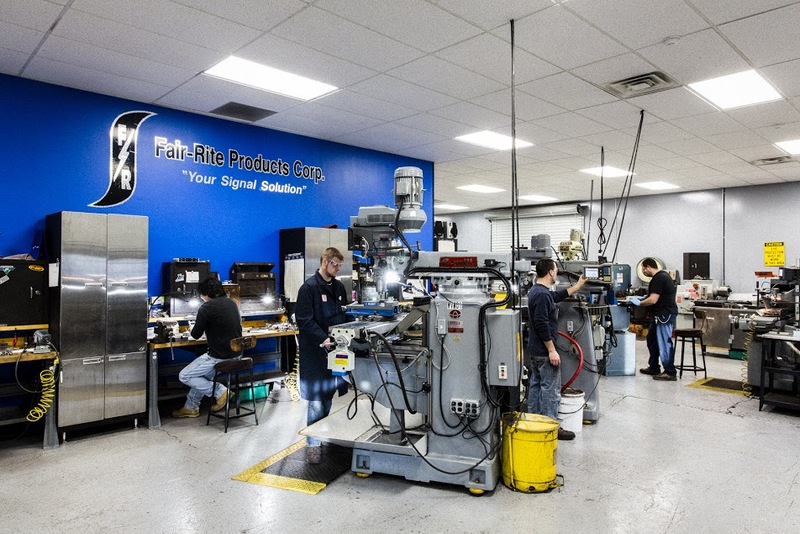 Fair-Rite has state-of-the-art equipment to provide you with quickturn prototypes for proof of concept before committing to production tooling. This allows our customers to quickly evaluate their design, experiment with different variations and determine the final product while maintaining their development schedule and budget. 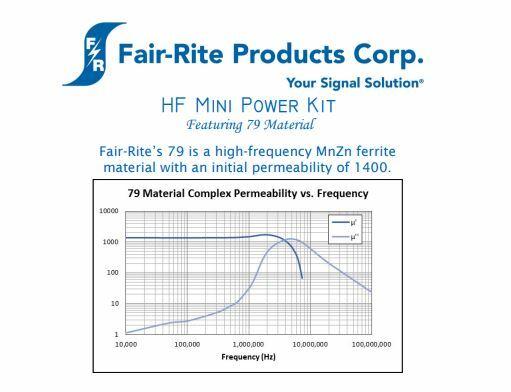 Fair-Rite’s HF Mini Power Kit (for 67 Material) contains various sizes of toroids, EQ and I cores for designers to test how 67 Material will perform in their design. Optimized for power applications between 5 MHz and 25 MHz, 67 Material is suitable for high-frequency switching power supplies where low core-loss and a stable temperature response are imperative for a successful product. This pamphlet, which comes with the kit, contains vital information regarding 67 Material and the included parts. To request a kit, please contact your local sales representative or request a sample today! The range and efficiency of wireless power transfer systems are limited by the quality factor of the transmit and receive coils used. Multi-layer self-resonant structures have been proposed as a low-cost method for creating high-Q coils for highfrequency wireless power transfer. In these structures thin foil layers are separated by a dielectric material in order to form a capacitance that resonates with the inductance of the structure, while also forcing equal current sharing between conductors. In order to reduce winding loss, these structures are made with foil layers much thinner than a skin depth, which makes the layers of the structure extremely difficult to handle. In this paper, we present a modified self-resonant structure in which the layered conductors are made from standard PCB substrates with no vias. The PCB substrates provide an inexpensive way to handle thin conductive layers, and the modified self-resonant structure ensures that the poor dielectric properties of the PCB substrates do not impact the quality factor of the structure. The modified self-resonant structure makes it feasible to achieve advantages similar to litz wire, but at multi-MHz frequencies where effective litz wire is not commercially available. Experimental results show that the structure has a quality factor of 1177 at 7.08 MHz, despite only being 6.6 cm in diameter. 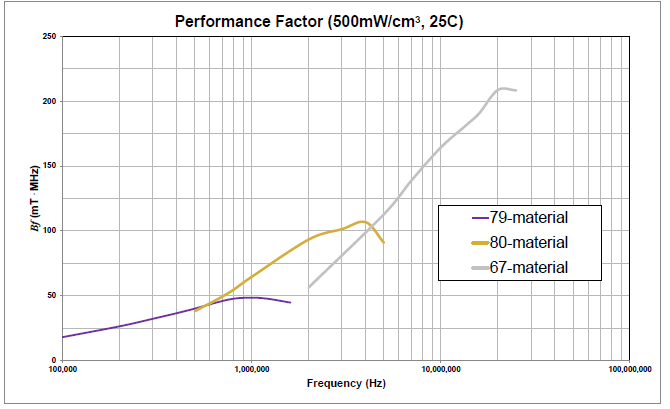 The quality factor normalized by the diameter is more than 6.5x larger than other coils presented in the literature. 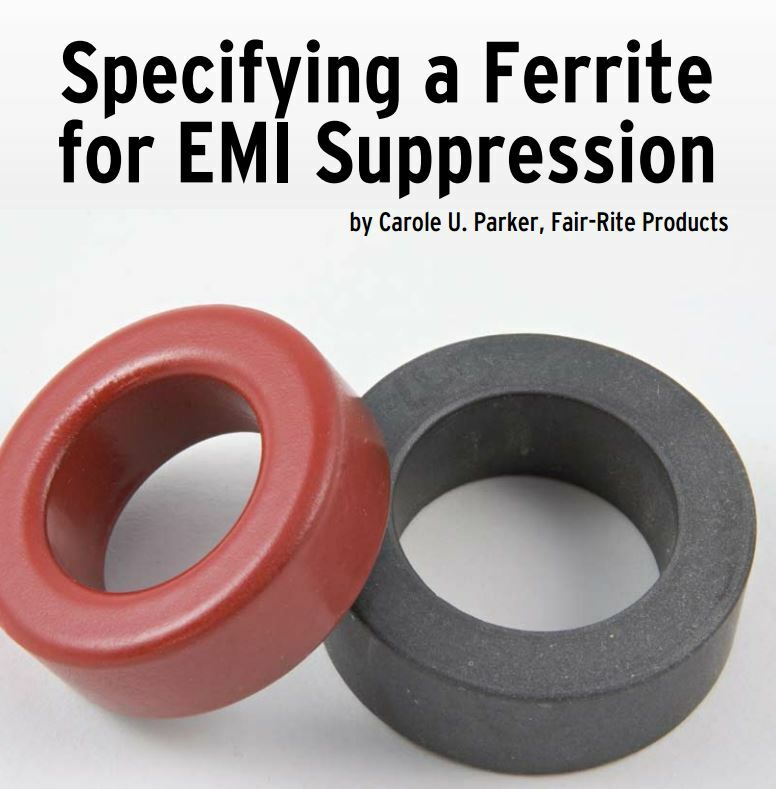 By Rachael Parker, Vice President of Fair-Rite Products Corp.
Ferrites are ceramic components that can be used to suppress electromagnetic interference (EMI) in certain applications. 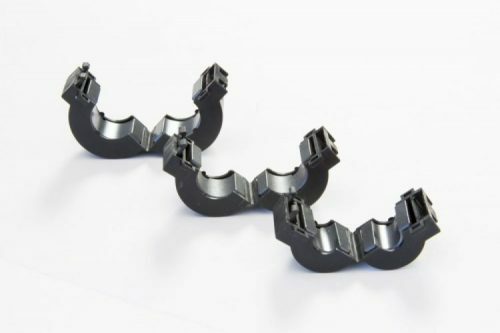 This paper will discuss the basic properties of solid round ferrite cores, the impact an air-gap can have on the performance of these cores, and special considerations. 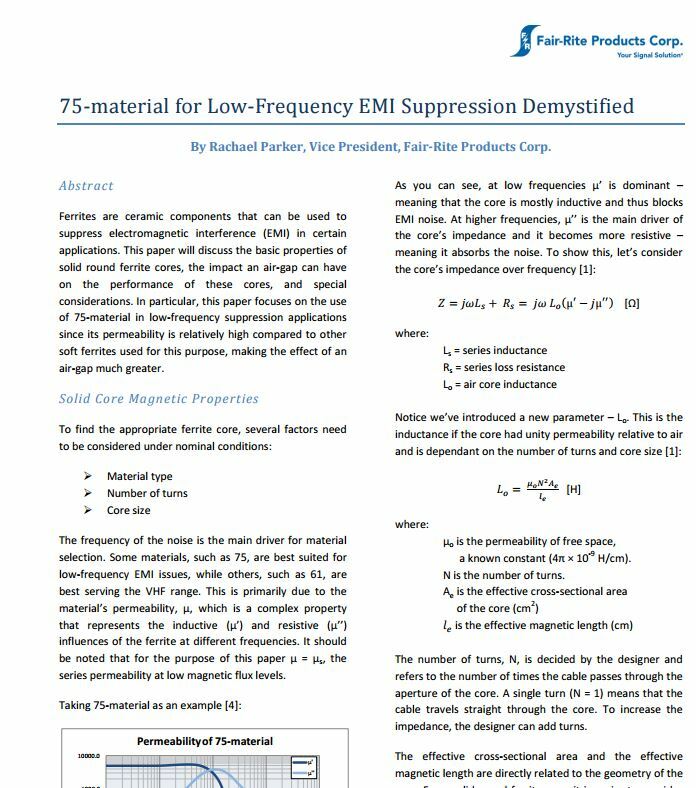 In particular, this paper focuses on the use of 75-material in low-frequency suppression applications since its permeability is relatively high compared to other soft ferrites used for this purpose, making the effect of an air-gap much greater. Electronics are profoundly changing the automotive industry as the Internet of Things (IoT) and mobile connectivity become more prominent in our vehicles. Electronic content in cars has steadily increased, and this trend is only expected to accelerate. However, with the adoption of technology comes an increase in EMC, power and signal integrity issues. Coupled with growing concerns over robustness and safety, automakers are forced to strike a balance between cost, performance, and quality. With an assortment of materials to suppress frequencies from 100 kHz into the GHz range, Fair-Rite has the spectrum covered. Once again, Fair-Rite Products Corp. is the first to introduce an innovative solution to the electronics industry! Our new 75 material is now available in Snap-It form so you can quickly find a solution to your low-frequency noise issues. Providing enhanced impedance between 150 kHz and 10 MHz, this material is superior to any other product available on the market and delivers twice the impedance at 1 MHz. 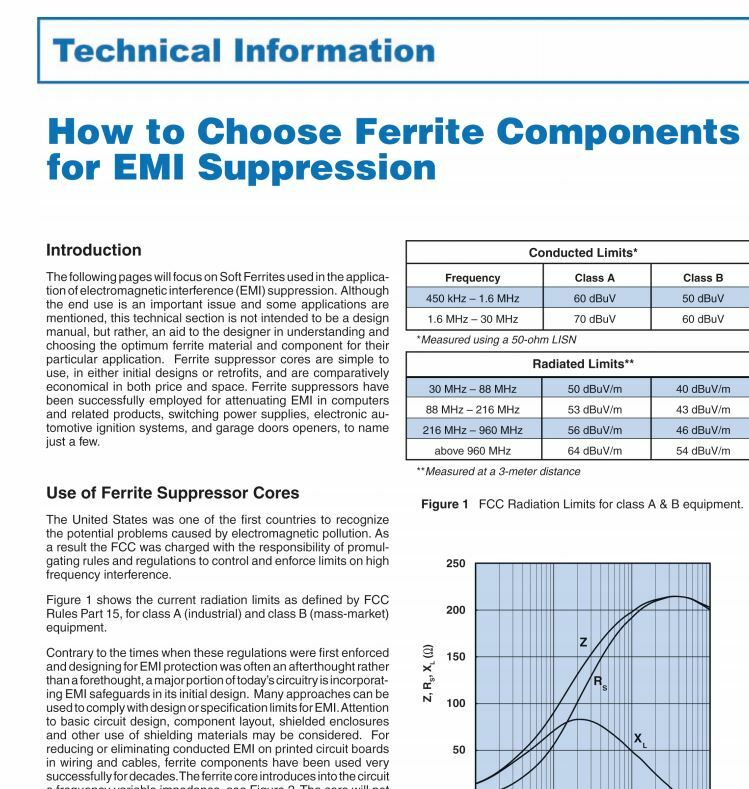 Our past article (see “How to Choose Ferrite Components for EMI Suppression,” Conformity, June 2002) was intended to help design engineers optimize the performance of ferrite materials by analyzing the effects of frequency, field strength, temperature and core geometry. In our ideal world, safety (including effect on environment), quality and performance are paramount. 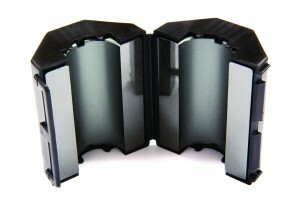 In many transformer designs ferrites are used as the core material. 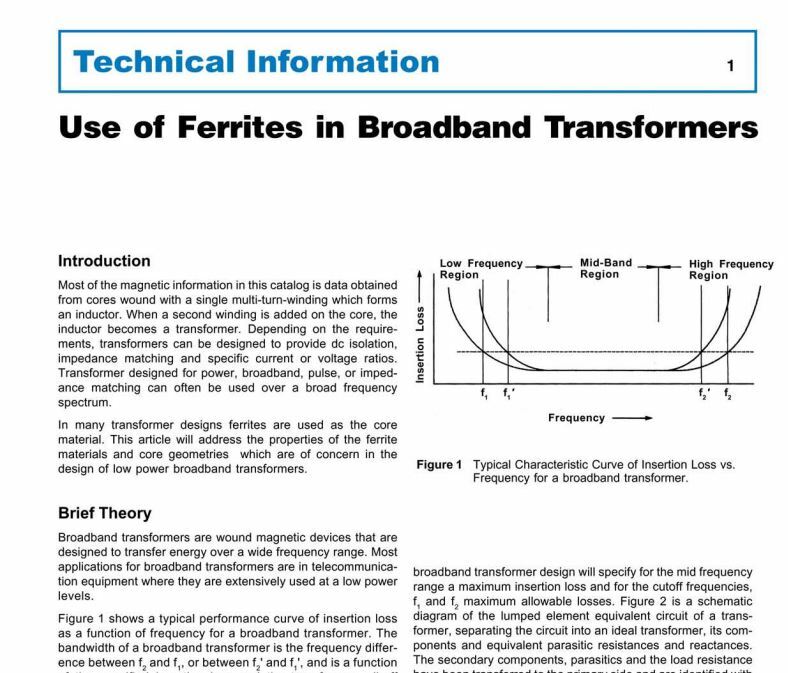 This article will address the properties of the ferrite materials and core geometries which are of concern in the design of low power broadband transformers. Broadband transformers are wound magnetic devices that are designed to transfer energy over a wide frequency range. Most applications for broadband transformers are in telecommunication equipment where they are extensively used at a low power levels. Fair-Rite’s Flexible Ferrite Sheets provide the benefits of soft-magnetic materials, while freeing you from their mechanical constraints! These materials are composed of NiZn to provide high-volume resistivity and high insertion-loss over a broad frequency range. Available in six material grades and four standard thicknesses as thin as 0.13mm, these RoHS compliant sheets come “scored” in a 2mm x 2mm rectangular grid.